Plans have been afoot for a while to remake the old Goddard House nursing home at 201 South Huntington Avenue in Jamaica Plain into a residential something or another. 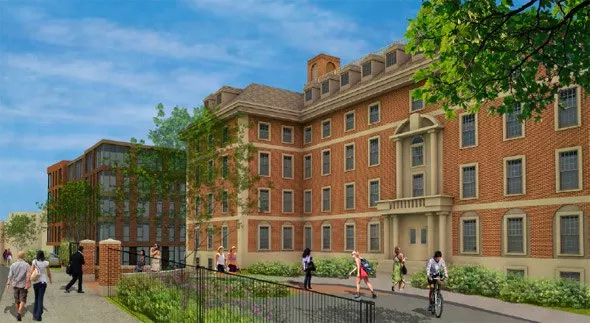 On Thursday evening, the Boston Redevelopment Authority signed off on the latest plans for the Georgian Revival, which dates from 1927 (the nursing home closed in 2012). A development team that includes Fenway rainmaker Samuels & Associates will rehab the building and add to it, as well as construct a second building on the property. All totaled, the development is expected to produce 167 apartments. The rehab in particular satisfies some locals, who wanted to see the Goddard House preserved rather than demolished. That was the fate of the old Home for Little Wanderers across the street, which became the ground-up Olmsted Place complex. As for the Goddard House project, construction could start next year.